- The first thing I thought upon logging in was that the graphics seemed sharper somehow and the colours brighter. I kept noticing little details about the environment that I'd previously overlooked. Then I read the patch notes and got official confirmation that they did indeed upgrade the graphics a notch. All I can say is: it shows, and it looks good. - The first thing I did was fly to Hoth and buy a tauntaun mount. Whee! I was a bit worried that they'd cost Cartel Coins or something, but they can actually be bought for credits. At two million a pop they still don't come in cheap, though it's nice that there's a version for subscribers that costs half a million less. 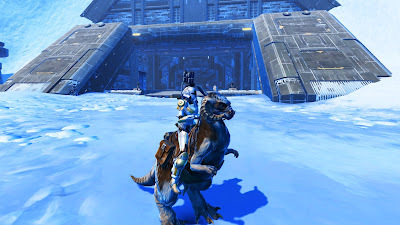 The actual buying process was a bit confusing to me at first because you can't just buy the tauntaun right away, you have to buy some tokens first which you then trade for the mount. The reason for this is that apparently there is an alternative way of gaining these same tokens by feeding tauntauns out in the wild or something. Usually I'd be all over playing instead of paying, but the first thing I saw upon arriving on Hoth was people moaning in general chat about how bad the success rate of this method was, and to be honest I wanted my tauntaun now, so I was happy to just hand over the cash instead. - I also picked up my new Ewok companion. She's kind of funny, but I have to admit I was a bit disappointed that there isn't more of a story to how you get her. Hiring a random mercenary for your crew just seems a bit... odd for most classes. I haven't actually used her yet either, as she only comes with level ten gear and I need to buy her some bits that are actually useful at my level. I do think it's kind of neat that Bioware added this whole bazaar area for Cartel Market related stuff (which is where you have to go to get Treek). Better than having it encroach on other areas of the fleet in my opinion. - I haven't tried the new flashpoints yet, but I did have a look at the daily area. I think it's a neat idea that instead of adding a heroic quest for the weekly, they included the new flashpoints in it. That just goes well together and might actually encourage me to do dailies more often (since I'm more likely to get the flashpoints done first, and then I'd be like "hmm, might as well knock out that handful of dailies..."). Actually getting any quests done was a bit of a pain since the area was crazy busy, but respawn times weren't too bad. I loved the mission where you get attacked by giant tentacles. - On the PvP front, I only got into one Civil War match, where someone immediately asked whether it played very differently with the change to the side speeders, to which the reply was: "yep... if you are defending [you] need to fight in all the bad middle of nowhere spots... it's odd". I didn't feel like I really got to experience that, but it was notable that the side turrets changed hands more than once and we actually won even though our opponents were pounding us quite badly. I'm guessing that with the old system we wouldn't have been able to get either of the side turrets back with that much opposition. I'll have to play some more games to see how different it really feels.